With only 12km to go to reach the lodge I took my time again today. 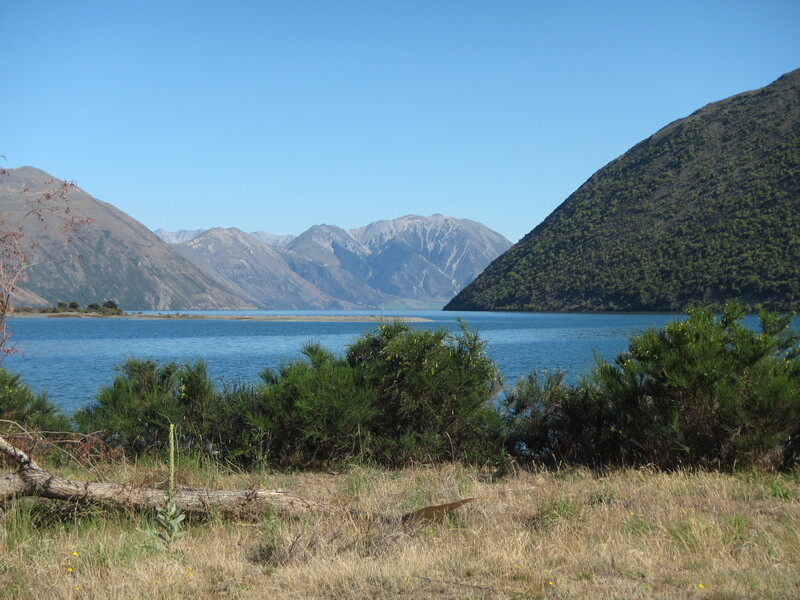 It was a really quick easy road walk from the lake to Lake Coleridge Station where the trail entered into a farm and followed along the edge of Lake Coleridge itself for a couple of kilometres before leading through paddocks. This short section through the station basically links two roads and cutting off a longer trip around all on roads. The paddocks were easy walking and offered some great views across the lake itself. Once back onto the road it was another quick road bash towards the small village of Lake Coleridge. 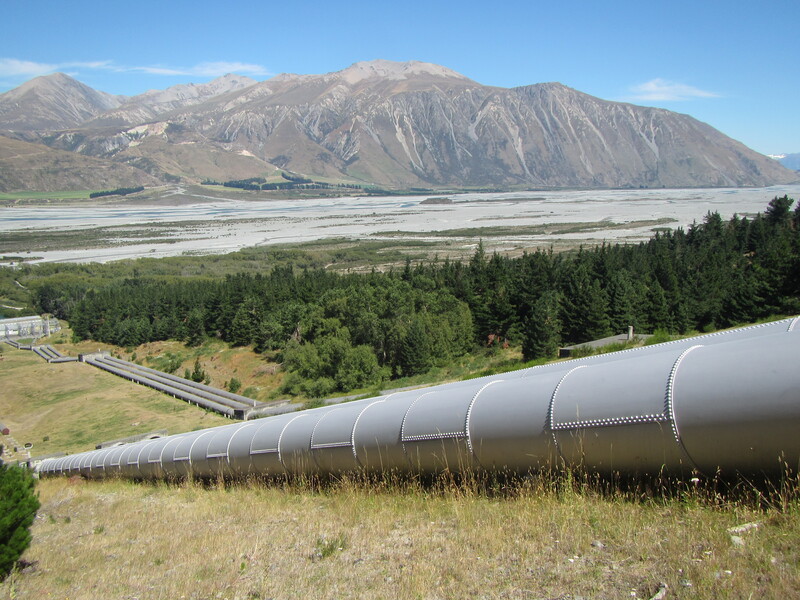 Just before hitting town the trail took me out above the massve hydro pipes feeding from Lake Coleridge down to the Powerhouse down by the Rakaia River. The whole village area was developed during the construction of this major hydroelectric scheme around 1915 and has had several redevelopments. The Lake Coleridge Lodge that I’m staying at was once the singlemans quarters for the scheme, now a nice retreat. Arriving at the lodge just 12 o’clock I wasvable to check in and collect my food package. I also made the final arrangements for a shuttle around the Rakaia River hazard zone tomorrow and was able to spilt the cost with another TA tramper. The TA trust deems the Rakaia River a hazard zone and does not actually form part of the TA trail. The river is a wide braided river around 3km from bank to bank and is just too fangerous to cross on foot. It can flood at any time and is constantly changing form, making it impossible to have a safe route marked out. Along the way I’ve heard mixed reports from north bound trampers and the rivers crossability. Some have been able to do the crossing easily encountering nothing deeper than knee height water. Others have experienced waist deep crossings and a couple have talked about being swept down stream for 10 to 30 metres. Most just skip it as recommended by the TA trust. It’s a bit easier for north bounders to judge the crossing as they encounter the deepest channels early on and it’s easy to turn back. For south bounders it is possible to start a crossing, working from braid to braid and only finding the river uncrossable right over the far side and then requiring one to back track. This is the one feature on the TA that I promised Jacinta I wouldn’t attempt, given the treacherous nature of it, and so have opted for a shuttle around tomorrow morning. The rest of the day was spent sorting out my food resupply box and resting. Once again I’ve over judged the time it would take between sections and have sent ahead far too much food. A couple of other trampers came in throughout the day and its was great to share a beer and catch up on their stories. Some were headed south, others north. The Lake Coleridge Lodge was a great help and the hosts there are wonderful. Super friendly, they have great knowledge of the TA, the river crossing and know what trampers are all about. Needless to say I was looked after really well and had a relaxing half a day of rest.